Brett spent some time with Steelers Nation last Sunday at The Pub at Tonidale. He even was even able to enjoy some delicious birthday cake! 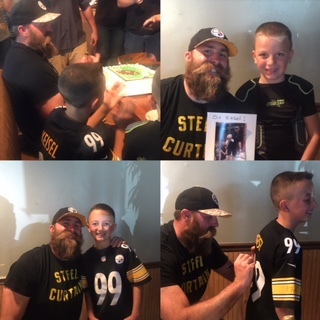 I just wanted to say that our kids have been watching you since they were old enough to pay attention to the Steeler Games! They chanted, cheered, praised and loved you every step of the way! There was no question to them when they got their puppy with a big beard that his name had to be Keisel! We continue to cherish our favorite retired player with jerseys.. memorabilia and our pups name everyday! Your awesome and we appreciate taking the time with our kids for the second time! They are youth football players and it was nothing short of amazing to see their faces light up today! Keep being you! « And, the winner is….